The start of Sunday's Frostbite League race at Bushfield. It was business as usual for Paul Vernon in Sunday’s Frostbite League race at Bushfield. The Peterborough Triathlon Club (PACTRAC) member dominated the series last season,winning all six races, and he was at it again as he scorched to victory on a foggy Orton course. Vernon, who missed the first race in this year’s series, crossed the line in a time of 26.34, 18 seconds ahead of runner-up Patrick O’Hare of Cambridge and Coleridge, with Hunts AC’s Ian Turner coming home third. 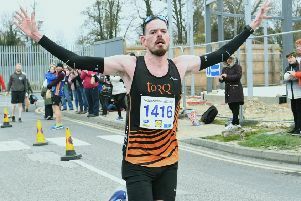 Three Peterborough-based runners made the top 10 with the Nene Valley Harriers pair of Chris Warnes and Michael Channing finishing fifth and ninth respectively and James Whitehead of Werrington Joggers coming home 10th. The first lady across the line was Werrington’s Rachel Cribbs, who finished 72nd overall in a time of 31.21. Second was Ramsey Road Runner Lisa Marriott and third Hunts AC’s Siobhan Skinner. Caroline Woods, the first local female finisher in the Great Eastern Run, was fifth lady in the colours of Yaxley Runners, while PACTRAC’s Abi Schofield was sixth and Werrington’s Ellie Richmond seventh. It was a good day for Werrington Joggers with the club finishing in third position behind Hunts AC and PACTRAC. Nene Valley Harriers had a large contingent of athletes competing in the National Cross-Country Relays the previous day and despite fielding a much weakened team finished sixth, leaving them third in the overall standings behind Hunts AC and Riverside Runners after two races. Werrington Joggers are fourth with PACTRAC fifth. The junior race was won by Hunts AC’S Joey Croft with her team-mate Shannon Flockhart leading the girls home. Flo Brill and Katie Tasker, who had starred for Nene Valley in the National Cross-Country Relays on Saturday, completed a highly successful weekend taking second and third places, but this time in PACTRAC colours. PACTRAC’s youngsters finished second with Nene Valley fourth. In the overall standings Nene Valley are third, one place ahead of PACTRAC. The next race is atHuntingdon on December 13.